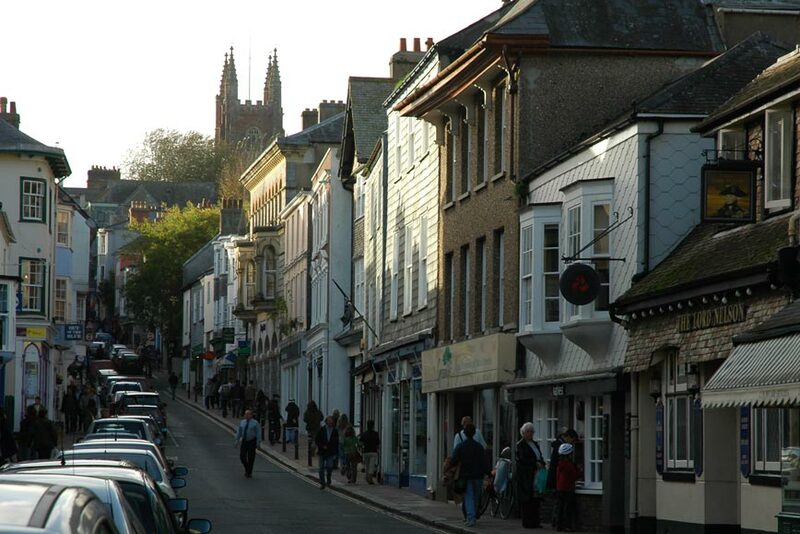 Totnes is a charming Devon town with a bustling main street and a regular market. Totnes has regular outdoor markets on Fridays and Saturdays. During the main season, between May and September, there is an Elizabethan market each Tuesday morning, where local people and traders go about their daily business dressed in Elizabethan costume. Alongside is an all-day craft market. 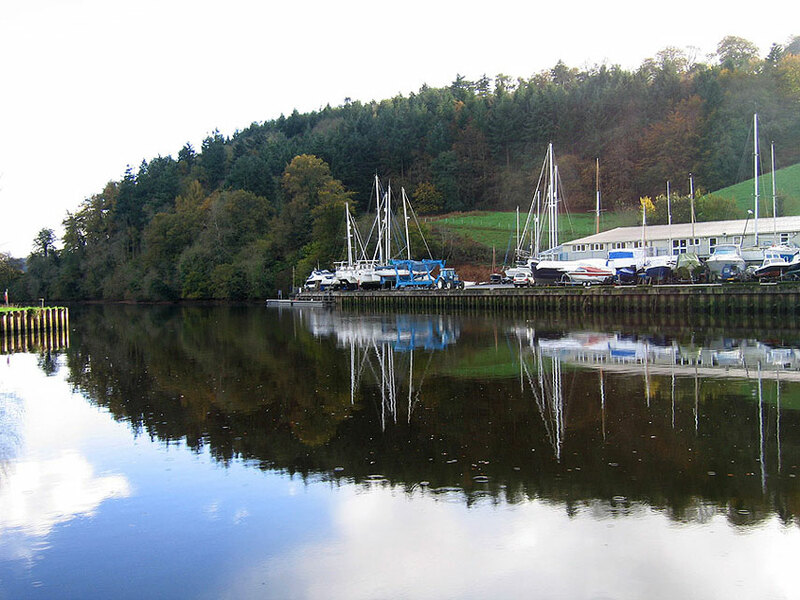 Situated in the Dart Valley running through, Totnes is surrounded by woodlands, grassy fields and riverside walks. It is built on a hill rising up from the Dart. The old warehouses on the wharf have been restored preserving the character of the place. An historic town, with its roots in Elizabethan times, Totnes has a reputation for welcoming alternative lifestyles. Consequently it is a place full of contrasts. It is the second oldest borough in England, and is full of interesting diversions for the visitor. There are museums, a riverside with steamer quay and a multitude of historic buildings, with examples of properties dating back to Norman, Medieval and Tudor times. There are 66 houses in Totnes dating to before 1700. 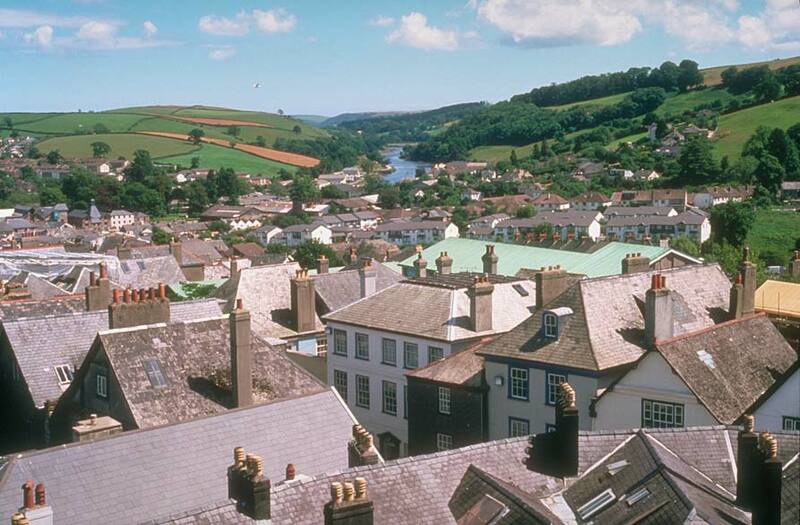 The name Totnes derives from the Saxon word for a fort or a lookout on a ridge. The town was originally a fortified Saxon settlement, built to protect the upper reaches of the river from Viking raiding parties. It was one of the five Devon towns originally mentioned in the Domesday Book and was one of the wealthiest towns in medieval Devon. The town’s wealth and prosperity came from the export of both wool from Dartmoor and locally mined tin. This was due to the location as both the highest navigable port and the lowest bridging place on the River Dart. At the bottom of the town is the Old Steamer Quay, now the centre for local river cruises to and from Dartmouth, six miles downstream. From the quay, Fore Street leads up into the centre of the town, passing under the East Gate Arch, a splendid Tudor structure. Set in the ground close by is the Brutus Stone, which legend says marks the spot where Brutus, a Trojan prince, stood before founding Totnes and the country named Britain after him. The street contains many fine examples of 16th and 17th century merchants’ houses, including the Elizabethan House, which houses the Totnes Museum. This half-timbered Tudor merchant’s house is an excellent architectural example of this type of period property. The museum has a good display of local history. There are various interesting displays of the lives and works of various well-known former inhabitants including Charles Babbage, inventor of the computer, and the museum features an exhibit of early computers. 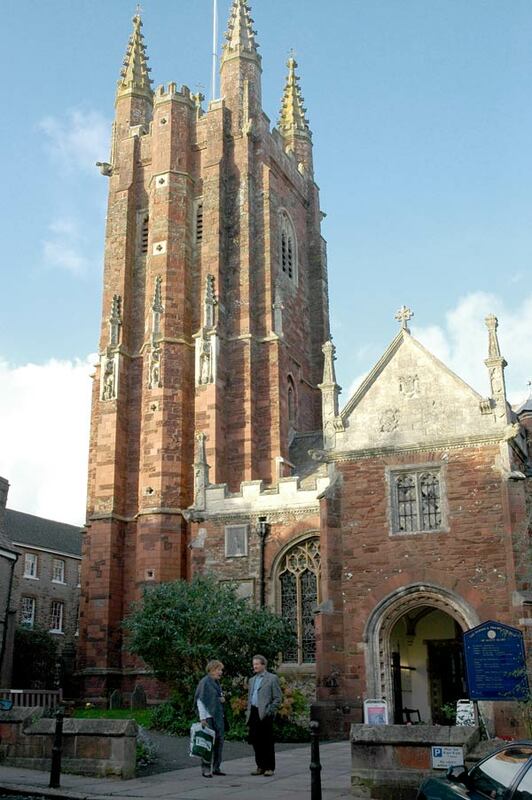 The Totnes Guildhall was originally part of the Benedictine Priory, and has since fulfilled a number of purposes. It is situated on Ramparts Walk and is a well-preserved 16th century building. The Hall, which was constructed in 1533, still serves as a council chamber. It has been a school, a courthouse and a Guildhall. The present building dates from 1553 and is still used by the town council for meetings and functions. It contains prison cells, a council chamber and a mayor’s parlour. Visitors to the Guild Hall can see the table where Cromwell sat in 1646. 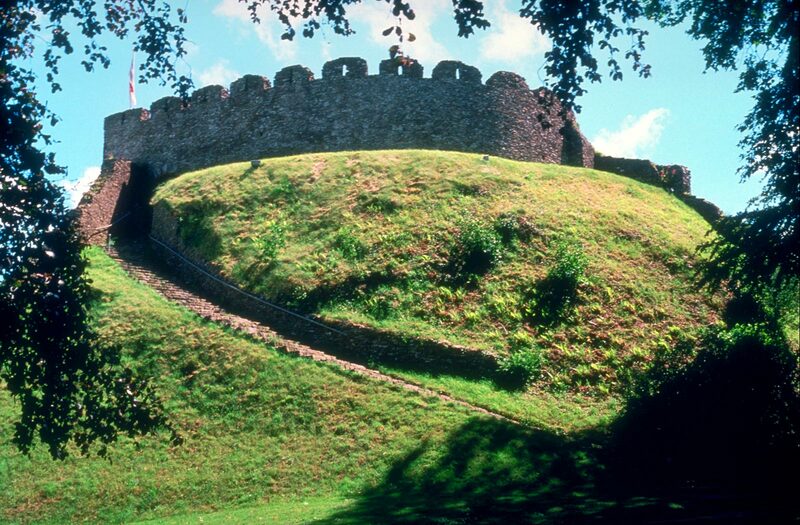 Totnes Castle, a classic example of the Norman motte and bailey, dominates the skyline and offers splendid views of the town and Dart Valley from its ramparts. There was a Saxon castle in existence before the present building and there is even a rumour of an early Roman castle of some description. The Butterwalk and the Poultry Walk are striking features from the past of. These are two covered pavement arcades with stone pillars supporting the overhanging storeys of the houses. Sheltered markets were held there in the past. Similar pillared ambulatories can be seen in the nearby towns of Dartmouth and Kingsbridge. St. Mary’s Church has a fine 15th century rood screen, carved from stone quarried in Beer and painted. The corporation pews are still cushioned in red velvet for the comfort of the town’s dignitaries. The Narrows are a collection of narrow twisting streets at the top of the town. Along Leechwell Street is the town’s pub, the 17th century Kingsbridge Inn. Next to the pub, is the narrow Leechwell Lane, leading back down the hill. The passage leads you to the site of the Leech Wells, three ancient wells where water flows from springs into three granite troughs. The waters were believed to have medicinal properties and were administered by specially appointed Town Wardens. The healing waters in the Leech Wells were a point of pilgrimage for lepers hoping for a cure. An exhibition of Victorian costumes and accessories can be found in the Totnes Costume Museum in one of the oldest Tudor houses in Totnes. In addition there are many delightful shops and galleries, displaying and selling arts, crafts and unusual gifts. There is a compact shopping centre among the steep streets and plenty of cafés and restaurants. On the South Devon Railway, steam trains run to Buckfastleigh, the trip takes about an hour and also stops at Staverton. Not far away is Berry Pomeroy Castle, a late medieval castle and mansion house situated halfway up a wooded hillside, looking out over a deep ravine and stream. The original castle was constructed by the Pomeroy family following their arrival in England during the Norman Conquest. Originally made from wood, the castle was reconstructed in stone during the 12th century. The building is reputed to be haunted.